Delivered by MessageDeliveryBot on behalf of WikiProject Formula One at 11:59, 3 April 2012 (UTC). 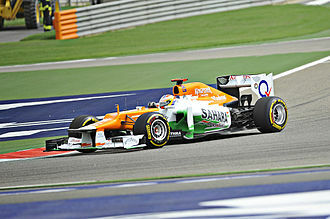 Delivered by MessageDeliveryBot on behalf of WikiProject Formula One at 19:41, 7 May 2012 (UTC). Delivered by MessageDeliveryBot on behalf of WikiProject Formula One at 02:18, 5 June 2012 (UTC). The newsletter is now being delivered by EdwardsBot. Lewis Hamilton extended the 2012 season's record by becoming the seventh different winner is as many races at the 2012 Canadian Grand Prix. At the following race in Valencia, Fernando Alonso broke the sequence by taking his second win of the year. Formula One, abbreviated to F1, is the highest class of open-wheeled auto racing defined by the Fédération Internationale de l'Automobile (FIA), motorsport's world governing body. The "formula" in the name refers to a set of rules to which all participants and vehicles must conform. The F1 World Championship season consists of a series of races, known as Grands Prix, held usually on purpose-built circuits, and in a few cases on closed city streets. The first Grand Prix was held in 1950 at Silverstone; since then 68 circuits have hosted a Grand Prix. Circuits such as the Nürburgring have hosted Grands Prix using different configurations. The first race at the circuit used the 22 kilometres (14 mi) circuit, but concerns over safety meant that more recent Grands Prix have used a shorter, safer circuit. F1 circuits were predominately in Europe during the early years of the championship, as the sport has expanded so has the location of its circuits. New circuits have been used in Asia and America, the change has been a recent occurrence. Of the 20 circuits that will host a Grand Prix in 2012, nearly half were not on the calendar before 1999. The Autodromo Nazionale Monza has hosted the most Grands Prix; it has been used as the circuit for the Italian Grand Prix 61 times. The only season it did not host a race was in 1980, when the Italian Grand Prix was held at the Autodromo Enzo e Dino Ferrari. The most recent circuit to have hosted a Grand Prix was the Buddh International Circuit, which hosted the Indian Grand Prix in 2011. The Circuit of the Americas is set to become the latest different circuit to host a Grand Prix; when the United States Grand Prix is staged there in 2012, at Austin, Texas. The Pescara Circuit is the longest circuit to have hosted a Grand Prix. The 25.800 km (16.031 mi) long circuit normally held the Coppa Acerbo race, it hosted one World Championship race, the 1957 Pescara Grand Prix. The 2012 German Grand Prix featured a race-long battle between Fernando Alonso (Ferrari), Jenson Button (McLaren), and Sebastian Vettel (Red Bull). Alonso ultimately held on to win, whilst Vettel was penalised for leaving the confines of the circuit to make a late-race pass on Button, dropping him to fifth place. The 2008 Hungarian Grand Prix (formally the Formula 1 ING Magyar Nagydíj 2008) was a Formula One motor race held on August 3, 2008, at the Hungaroring in Mogyoród, near Budapest, Hungary. It was the 11th race of the 2008 Formula One season. Contested over 70 laps, the race was won by Heikki Kovalainen for the McLaren team, from a second position start. Timo Glock finished second in a Toyota car, with Kimi Räikkönen third in a Ferrari. It was Kovalainen's first Formula One victory, which made him the sport's 100th driver to win a World Championship race, and it was Glock's first podium finish. * Grosjean did not set a time in Q3, after beaching his car in a gravel trap during Q2. † Nico Hülkenberg (9th, 1:54.382) was given a five-place grid penalty for a gearbox change. This page was last edited on 19 February 2016, at 07:59 (UTC).